The quintessential songbird was already entertaining natives of the windy Canary Islands in the early 1400's when Spanish monks began exporting them to Europe. They only sold the male birds, who were better singers, and couldn't reproduce. Germans later learned the trick of breeding captive birds, and Canaries became prized processions of royalty and gypsies alike -- singing tunes by Handel and Bach painstakingly taught with a tiny musical instrument called a flageolet, or a mechanical hand-cranked music box called a serinette. Books of music specially composed for canaries were published, and a bird might be tutored by a skilled "bird-whistler" called a siffleur d'oiseaux. Contests were wagered over birds (blinded with hot wires, to reputedly improve their focus) singing as many as six hundred songs in a hour under strict rules. In more recent times, underground coal miners were cheered by the songs of canaries whose sensitive dispositions served as early warning for coal gas poisoning. 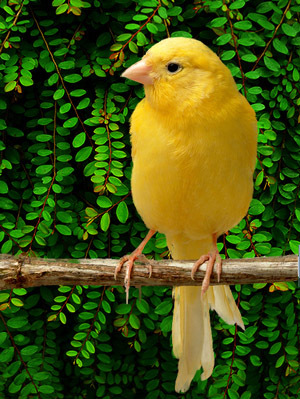 Over their years of domestication, Canary varieties have expanded to over seventy different breeds. Captive canaries went into a decline in England as organizations such as the Royal Society for Protection of Birds fought against caged birds. Many people today have never heard a canary sing in full throat. But I can assure you -- a truly amazing volume of music than can pour from the beak of this thumb-sized bird. My wife years ago took pity on a one-legged pet-store canary named Ahab -- and was rewarded with years of beautiful music. After the long, strange journey though 400 generations of human captivity, there is something ethereal in canary song that hints at sadness -- a yearning for the simpler songs of its green ancestors in the trees of the Canary Islands.